Comfort food - lasagna - FirstMed - Your Health Comes First! As winter sets in and it is gray and cold outside, you may start craving those foods that give you a warm feeling inside. On the coldest, darkest days of winter there is nothing like a good helping of lasagna to make me feel better. To be completely honest, my mom makes a fantastic lasagna, surprising since there are no traces of Italian ancestry in our blood, and it always helps warm me up inside. In Hungary one of the things which always held me back from making my own, rather than waiting for a trip home, was the impossibility of finding the type ricotta cheese I prefer when preparing the dish. Sure you could find in a few supermarkets but it’s only sold in small containers so if you’re making a casserole sized dish it will really blow out the budget. Instead I found a great substitution: Túró. Of course túró by itself is very much on the dry side, once you stir in some sour cream, it will look, and more importantly taste, very much like creamy ricotta cheese. Once you add the parmesan cheese and dried herbs, you’ll never know the difference. Below is my winter lasagna recipe which serves 4-6 people and should take about 2 hours of preparing and baking. 500 – 700 g cooked ground meat. Mixture of pork and beef is best. Place ground meat into a large saucepan over medium-high heat; add a large pinch of salt to season; cook and stir until meat is browned and crumbly, about 10 minutes. Break the meat apart as it cooks. 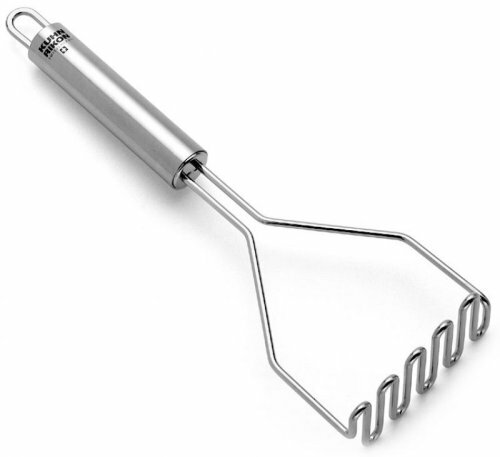 (quick tip, a potato masher works great for breaking up the meat). Once browned, drain off all fat and set meat aside. Wipe fat from pan and return to heat. Add a spoonful of olive oil and when heated add your diced onions. Cook until softened and translucent, about 5 min. Add half your minced garlic and tin of tomato paste. Stir and cook over medium high heat until the paste starts looking more brown (2-3min). You want to brown it but not burn. If it starts to look or smell burn add some water and reduce heat to medium. Return you browned beef to the pan. Taste to see if you need more salt. Add 2 cans of chopped tomatoes and enough of the pure to keep mixture from looking too thick. Reduce heat to low and simmer until meat is extremely tender, about 30min. Add a little more pure if sauce becomes too thick. Skim excess fat from surface of the sauce and season with more salt and black pepper, if needed. Stir in remaining garlic and turn off heat. In a large bowl mix túró, 2 eggs, a spoonful of dried basil and oregano, ½ of your parmesan cheese and enough sour cream to make it like a thick batter; you don’t want it too loose. In a casserole dish or baking pan, begin to assemble your lasagna. Spread 25% the meat sauce into the bottom of your pan. Top with 1/3 the noodles and spread 50% the ricotta cheese mixture over noodles. Spread another 25% the meat sauce over the cheese, cover this with a layer of the sliced cheese, another 1/3 of the noodles, and spread remaining 1/2 the ricotta mix over the noodles. Spread 25% the meat sauce over the ricotta mix. Lightly shake the dish to settle the layers. Arrange last 1/3 the noodles over sauce and spread remaining 25% the sauce over the noodles. Top of the casserole with diced fresh mozzarella cheese and remaining Parmigiano-Reggiano cheese. Cover with foil. Bake 55 minutes. Uncover and bake an additional 5 minutes at 210 degrees C, or until cheese is bubbly. Let stand 15 minutes before cutting and serving. FYI – You don’t need to pre-cook your noodles. There is more than enough liquid from the sauce to hydrate the noodles. If your sauce is very thick just add 100 ml of water around the edge of the pan just before covering tightly with foil. do not eat all of it in one sitting, difficult as it is quite tasty. This article appeared in our January, 2015 Newsletter. For further information about the online publication and to sign up, please click here.